Modi clears the air on the Bharatiya Janata Party's (BJP) supporting the triple talaq ordinance but supporting Sabarimala's ban on women. 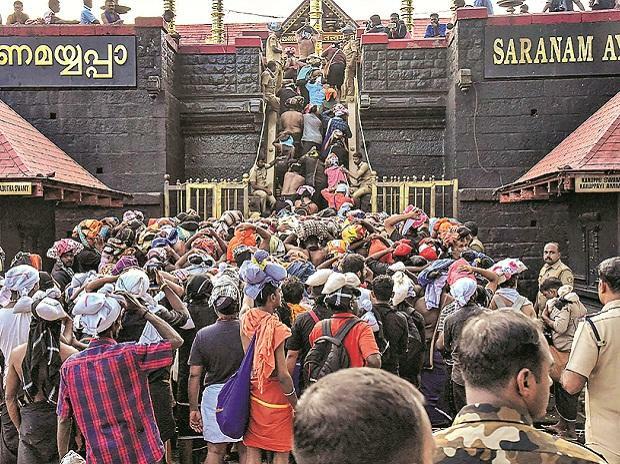 A view of the Sabarimala temple where menstruating women are banned from entering. The government issued an ordinance against triple talaq because it is a matter of gender equality, but the Supreme Court’s decision to allow women at Kerala’s Sabarimala temple needs to be “debated”, said Prime Minister Narendra Modi on Tuesday. Modi, in an interview to news agency ANI, tried to clear the air on the Bharatiya Janata Party's (BJP) supporting the triple talaq ordinance but supporting Sabarimala’s ban on menstruating women. Modi said the Sabarimala issue relates to tradition and a woman judge’s dissenting note in the Supreme Court judgment should be read carefully. “In this, Sabrimala, a woman judge in the Supreme Court has made certain observations. It needs to be read minutely. There is no need to attribute those to any political party. As a woman, she has made some suggestions. There should be a debate on that as well sometimes,” he said. "Triple talaq ordinance was brought after Supreme Court verdict. We have said in our BJP manifesto that a solution would be found to this issue under the Constitution," Modi said. "Most Islamic countries have banned Triple Talaq. So it is not a matter of religion or faith. Even in Pakistan, Triple Talaq is banned. So it is an issue of gender equality, matter of social justice. It is not an issue of faith. So keep the two separate."